Peter Dean has kept up the family tradition of boat making. 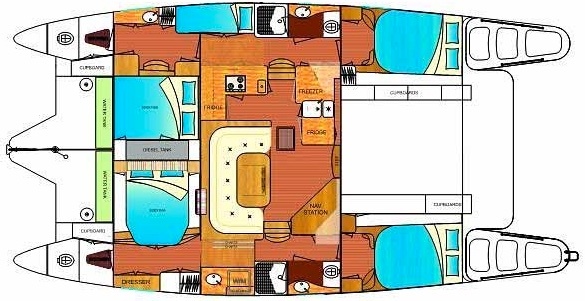 As a third generation catamaran entrepreneur, he strives to uphold the business’ reputation for quality and dependability.The hull of the Dean Catamaran is composed of quadriaxial stitched glass underneath the water line. Above the water line, the laminates have light weight balsa coring to enhance durability. Stainless steel and solid glass backing plates secure every deck fitting of the boat.The catamaran’s interior joinery and structural bulkheads are made of Nidacore composites with an outer wood veneer covering. The professionally designed electrical system is more than one might expect from most catamarans. Bubar tinned wiring and numbered circuits come together in a way that is useful and simplistic at the same time. Troubleshooting will never be a problem while onboard. During construction, the deck and hull are the first parts to be assembled. Next, the systems and drivetrains are added on. Because of this ingenious setup, if something needs repair work or replacing, it can be removed without any hassle. The tanks and engines that can be strenuous to take out of some built-in models are no trouble at all with the Dean Catamaran 441. This intelligently designed cockpit has a platform in the middle to optimize the field of view for those on board. By standing on the platform, anyone can get a clear look at the high cabin top. The helm seat is also a great place to be for accessing the sight lines. Single handling the Dean Catamaran is simple. All sight lines run to the electrical winch that can be seen in plain view. The decks are far from treacherous while moving about. A lot of small details went into the design to make moving around as easy as possible. One might be surprised by this since the Bimini top is so low. The majority of the foredeck is hard construction, but a few trampolines exist to keep things light. The guard rails surrounding the cabin top and forward arch are very sturdy and always within arm’s reach. Stairs help passengers reach the cabin top. There, the middle line hardtop is covered in suitable fabric material. The stern has sizeable davits that will hold up against a large tender. The accommodations inside the vessel are warm and inviting, classic without feeling stiff. Peter Dean likened them to a British cigar parlor. The navigation system is out of the way in the galley, giving passengers on board more than adequate space to fix a meal and dine in comfort. There’s enough space for around eight people to be able to eat without feeling limited.The two bedrooms are separated, with each one having its bathroom. Each berth is sizeable and forward facing berths go over the bridge deck. A common complaint seen in catamaran reviews is that they are all designed with generally slender hulls, but the ones on this catamaran aren’t uncomfortably narrow. Peter Dean believes one of the reasons his catamarans are growing increasing popular in catamaran reviews is because of the company’s willingness to give clients accommodations customized to their personal tastes. Buyers are not subjected to a one-size-fits-all layout and can choose from five different designs. In the nautical journey from South Africa to the United States, The Dean 441 averaged around eight knots. Making its way closer inland through the Chesapeake Bay, the catamaran sailed along between two and four knots with ease. Running just one of the two Mitsubishi diesel motors will obviously not be a silent experience since it’s propelling the boat at seven knots, but it’s not overly noisy either. Cruisers can expect to hear around a seventy DBA emission while in the galley. For those interested, here’re some closing specs on this fantastic boat that is getting outstandingly high catamaran reviews.The fuel tank can hold two hundred ninety gallons of gas, the water tank holds one hundred seventy-seven gallons, and the waste tank can hold up to forty gallons. The displacement is twenty-four thousand two hundred fifty pounds. The vessel is powered by two 42 horsepower Mitsubishi diesel engines. It costs around four thousand seventy-five thousand dollars, but prices may vary depending on customizations. 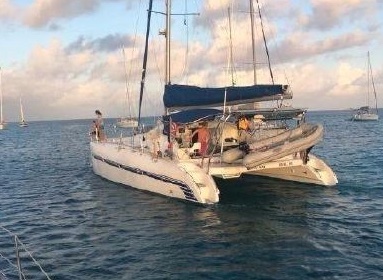 For more information, cruisers can contact Multihull Company in Philadelphia Pennsylvania, which is the United States authorized dealership for the Dean Catamaran.